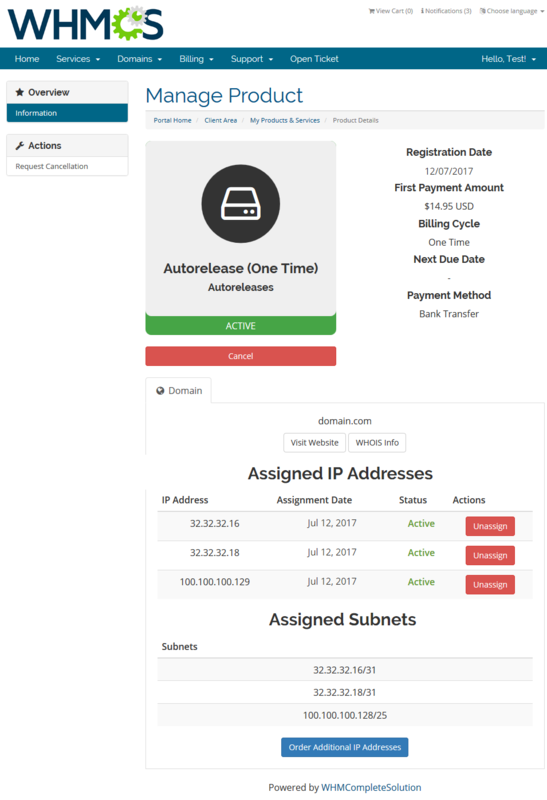 IP Manager For WHMCS allows you to conveniently add and manage IP subnets and automatically assign IP addresses to your servers, products, addons or configurable options. Our module will allow you to assign IP subnets to specified clients as well as integrate with 3rd party applications like cPanel, export IP subnets or view clear graphs. 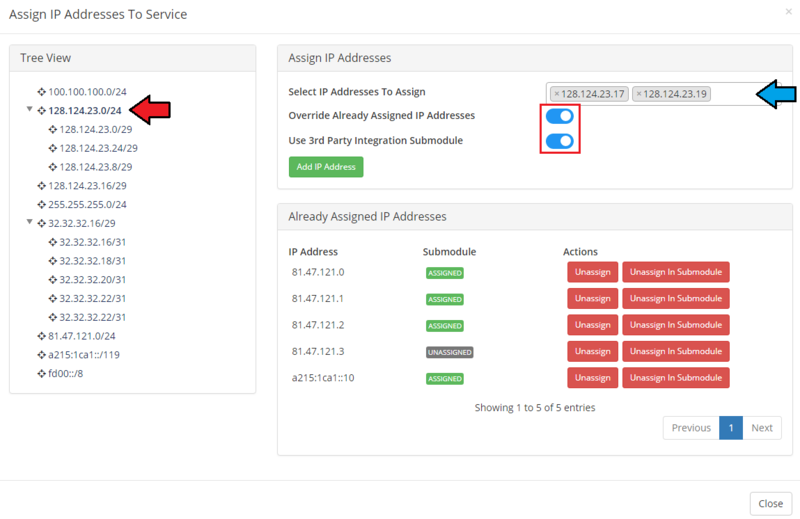 You will also be able to synchronize IP addresses used by products in your WHMCS system with the module's IP subnets. 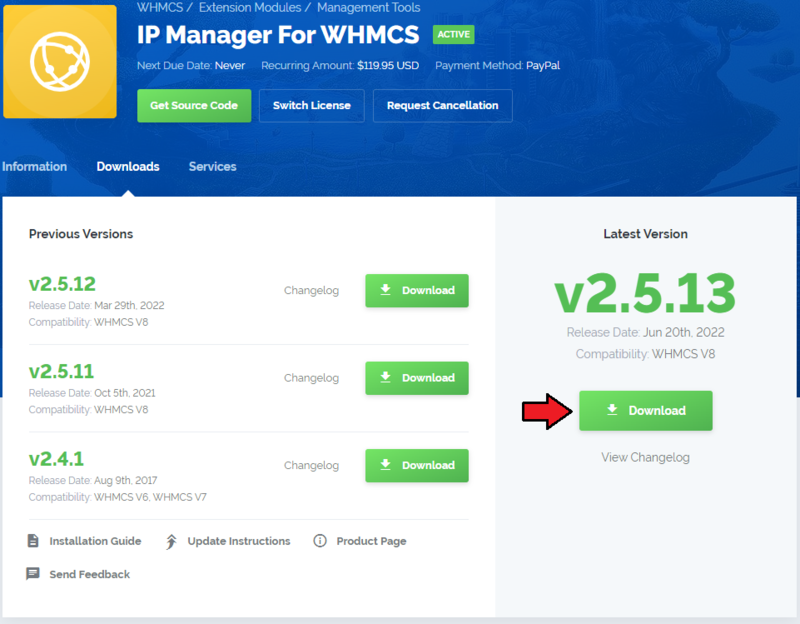 What is more, IP Manager For WHMCS will enable your customers to easily manage their IP addresses from the WHMCS client area. 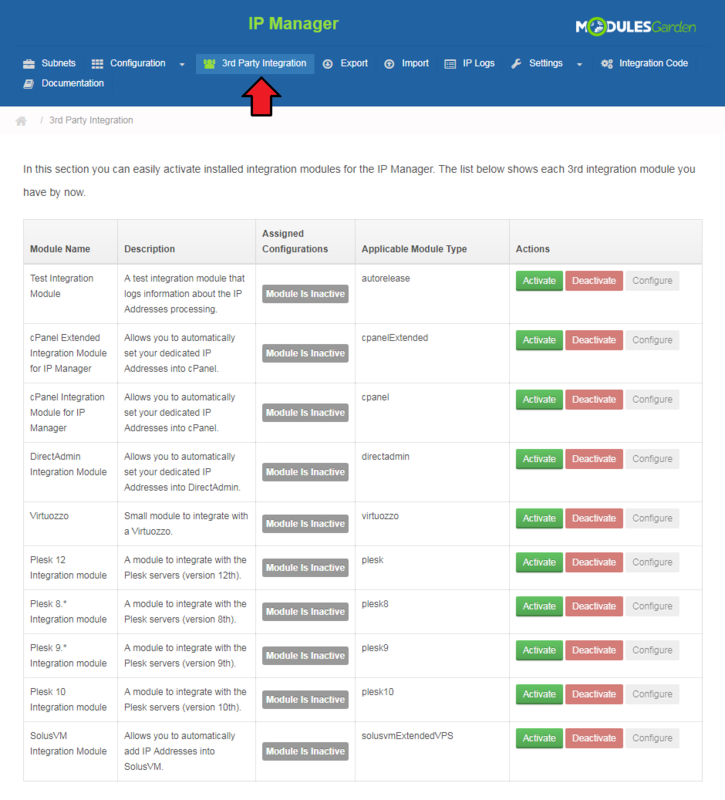 This tutorial will show you how to successfully install and configure IP Manager For WHMCS. 4. When you install IP Manager For WHMCS for the first time, you have to rename 'license_RENAME.php' file. File is located in 'modules/addons/ipmanager2/license_RENAME.php'. Rename it from 'license_RENAME.php' to 'license.php'. 6. Remove all files from 'templates_c' folder located in your WHMCS root directory. Log in to your WHMCS admin area and go to 'Setup' → 'Addon Modules'. Afterwards, find 'IP Manager' and press 'Activate' button. 8. In the next step you need to permit the access to the module. Click on 'Configure' button, tick desired admin roles and press 'Save Changes'. 9. The last step is setting chmod 755 to 'storage' folder. Folder is located in 'you_whmcs/modules/addons/ipmanager2'. 10. You have just successfully installed IP Manager! 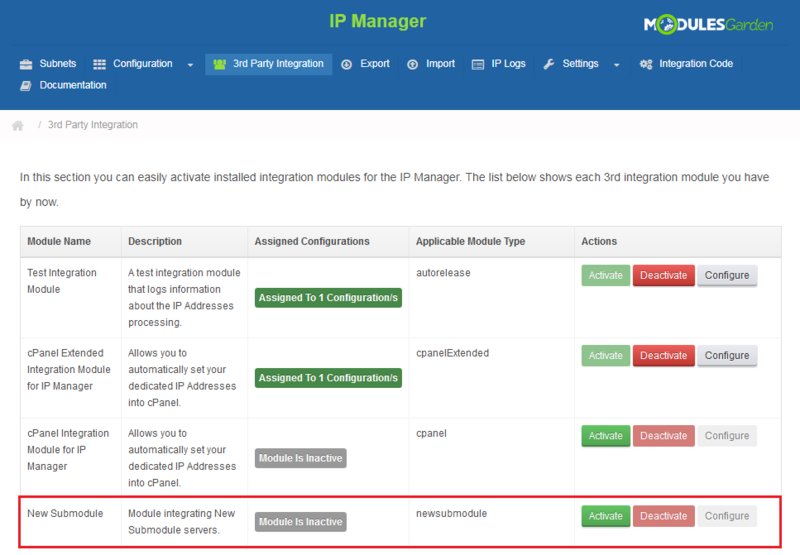 You can access your module in 'Addons' → 'IP Manager'. 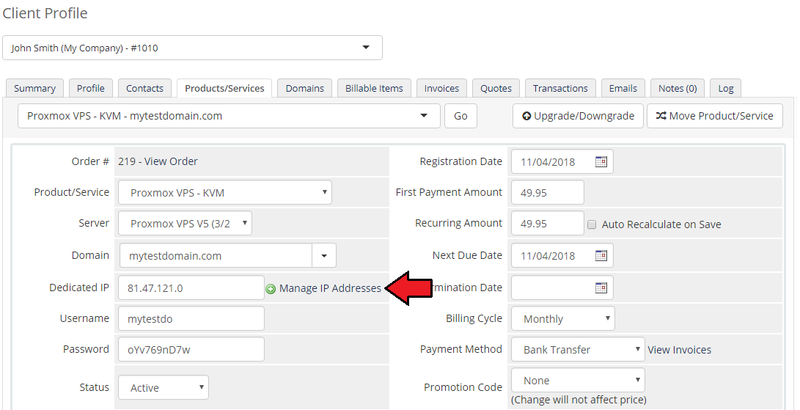 Additionally you can also add Integration Code to allow your customers to view and manage IP addresses assigned to their products. 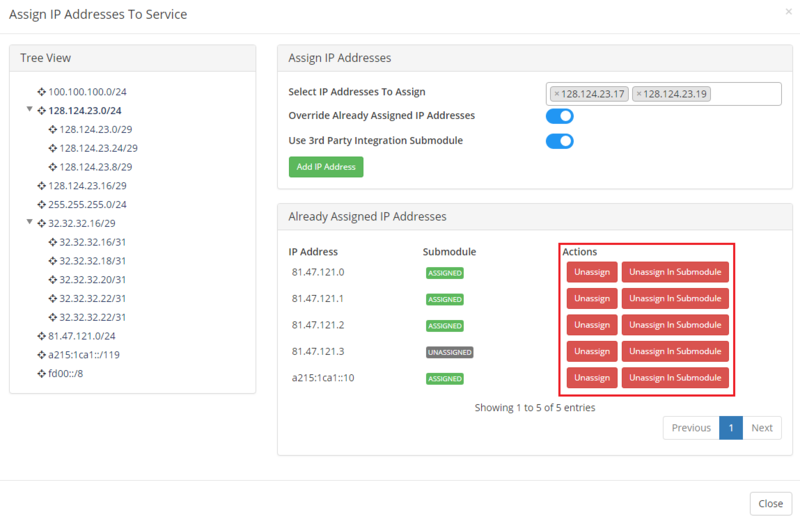 IP Manager For WHMCS allows you to manage dedicated IP addresses' subnets, automatically assign them to clients/products/servers/addons/configurable options. The module enables clients to manage and order dedicated IP addresses, IPv4 or IPv6. In this short guide the possibilities of the module will be briefly described. To manage any subnet via IP Manager you have to add it first. Remember that it is very important to configure any IP reservation rules before you create any subnets. If you add rules later on, they may not work properly! Read about rules reservation here. To begin, add a new IP addresses subnet, press 'Create New Subnet' button. Use 'Classless Inter-Domain Routing (CIDR)' notation to add subnets. First of all, select IP version: IPv4 or IPv6, type the subnet IP address and a correct bitmask. Note: The first IP from the subnet should be compatible with CIDR notation. You can exclude any number of IP addresses from the subnet. To do so, enter them into 'Excluded IP Addresses:' textarea, one IP address or IP range per line. If you want to set nameservers and gateway click on 'Toggle Advanced Settings'. Enter nameservers and gateway address into textboxes as shown on the screen below (This step is optional). Afterwards, confirm the creation of the subnet through pressing 'Add Subnet' button. 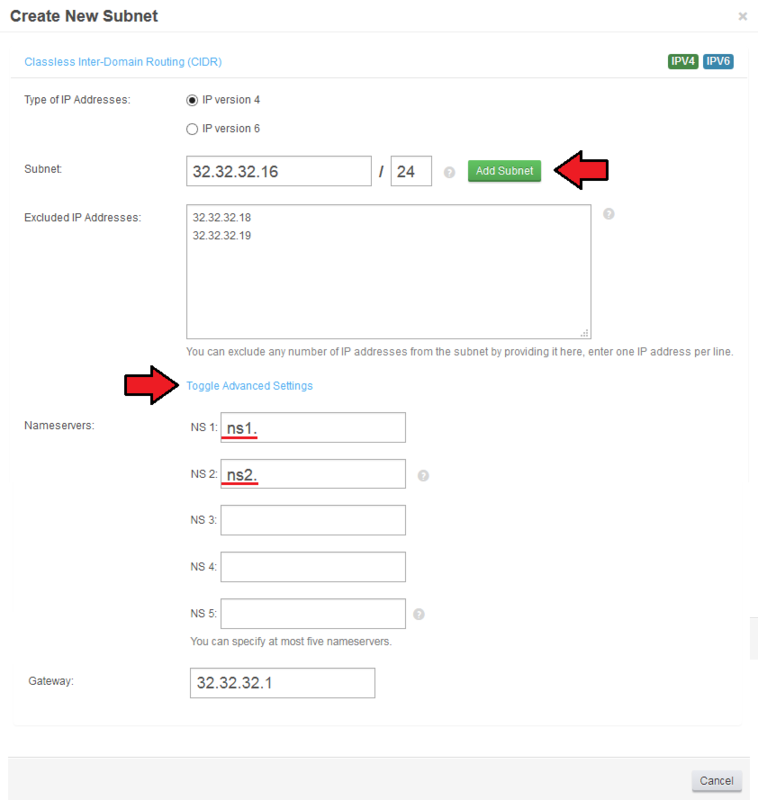 Once you have added some IP subnets you can preview some details on them and manage the IP addresses. As you can see on the following screen, you can find here a list of subnets in a tree view. Press any of added IP subnets to see its details. To view subnet's details press on its address as shown on the following screen. 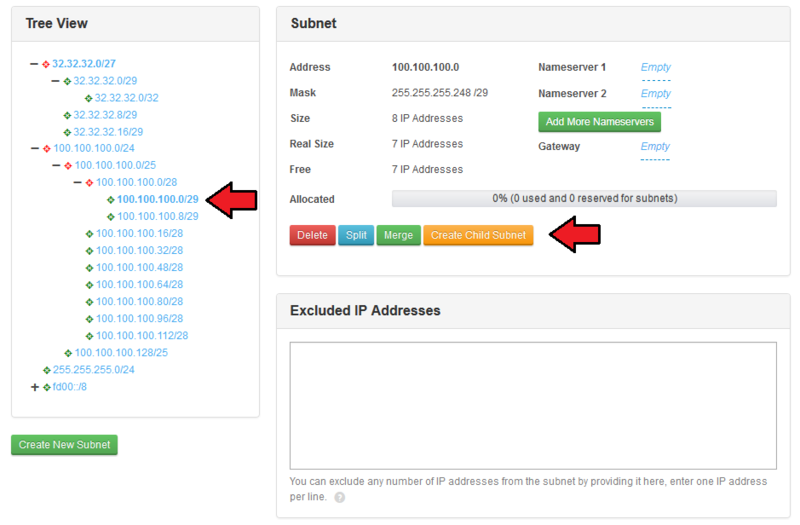 In 'Subnet ' field, you can find information about the address, mask, size, nameservers, gateway and many others. 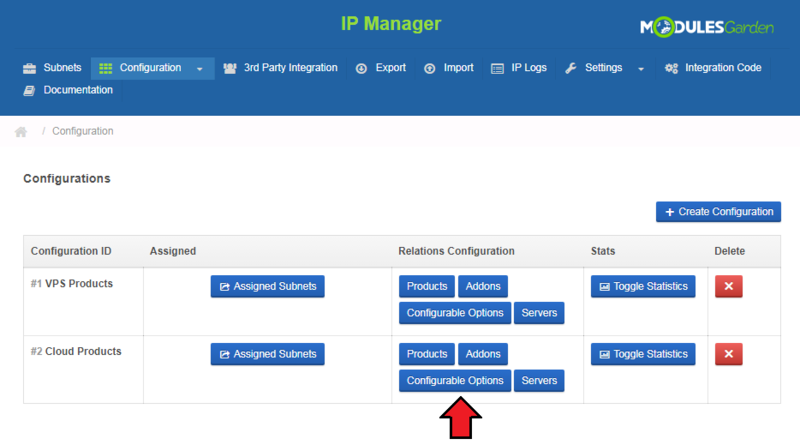 The most important functions of your IP Manager For WHMCS include some actions that can be done on subnets. Delete - use it to remove the subnet together with any IP address in it (if there are such already). Split - select split to divide the subnet into equal subnets according to the chosen mask. Keep in mind that the subnet may already include some assigned IP addresses. If you split such a subnet, the assigned IPs might be transferred to another subnet. Merge - use this option if you want to join previously split subnet. Note that you can merge only parallel subnets. Additionally, you must remember that merge action removes IP addresses from external servers. Create Child Subnet - this option allows to create subnet within a 'parent' subnet. Such s child subnet may again be split/merged, have its own child subnets. List of excluded IP addresses. You can remove some addresses from the list or add new ones. Important! If you have any IP reservation rules set up, then do not include single IP addresses here. This option should be used as an addition if you do not use rules. 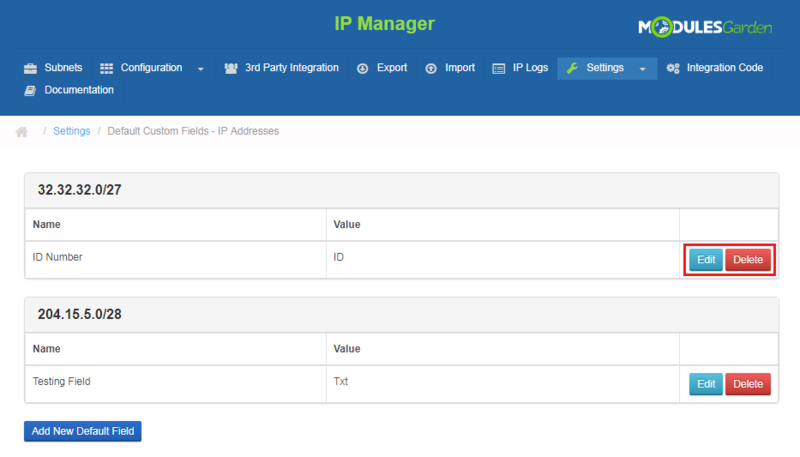 IP Manager allows you to add custom fields per subnet. To add a new custom field, press 'Create New Custom Field'. Afterwards, fill out the form with custom field name and value. Again, this option should be used if you do not specify default custom fields or if you want to add some additional ones. Be careful not to double custom fields here. If you wish to assign an IP subnet to a client or specific service, our module makes it available to you. You can achieve that through using auto-complete textbox to choose the client and/or service. Again, remember to 'Save Changes'. IP addresses will be added to all products ordered by client. IP addresses will be added to all addons included in products. Keep in mind that a subnet that is assigned to a client is reserved for this client only. The easiest possible way of creating IP addresses within the created subnet. 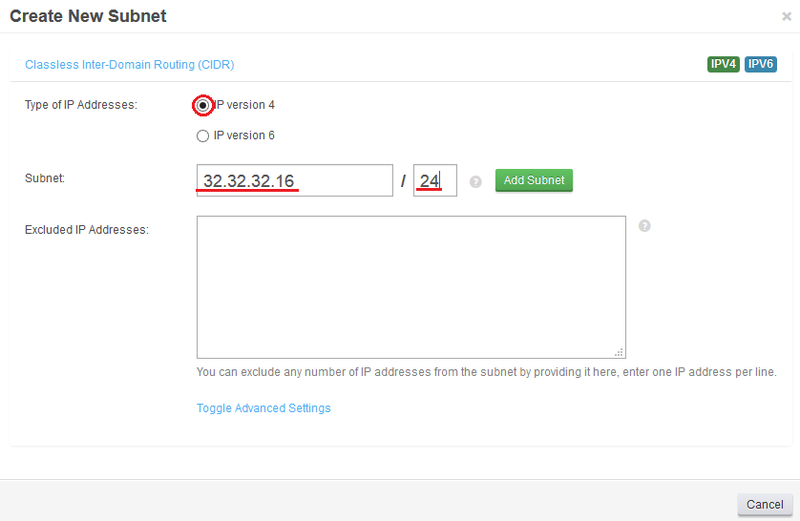 Simply select the number of IP addresses you want to create and press 'Add IP Address' button. New address in the subnet will be generated. You may also add an IP address manually. To do so, press 'Add Custom IP' button. Type in the IP address you wish to be created. Once the addresses are generated, you can proceed to their assignment. Use action or mass actions buttons to do so. 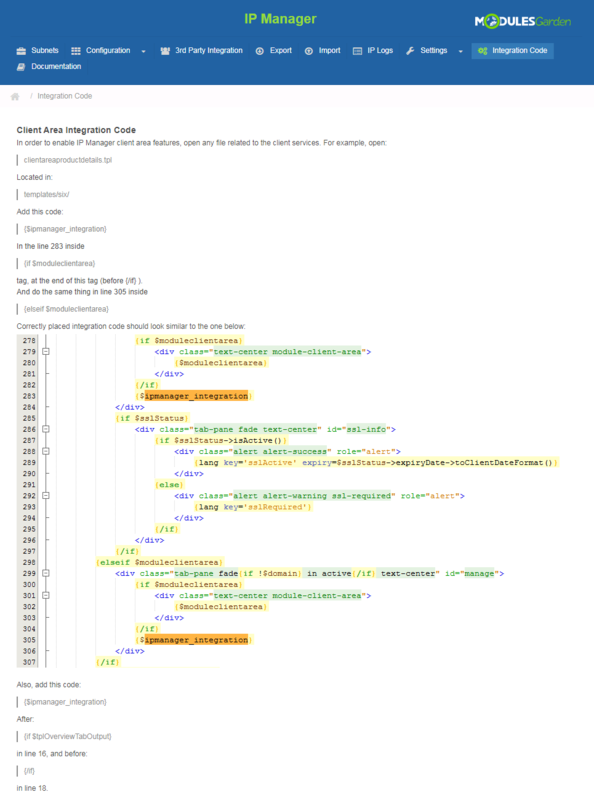 using 3rd party integration module or custom assignment. Choose the method you wish to use and save the changes. As you can see, IP address is assigned to the selected previously service (related to chosen domain). 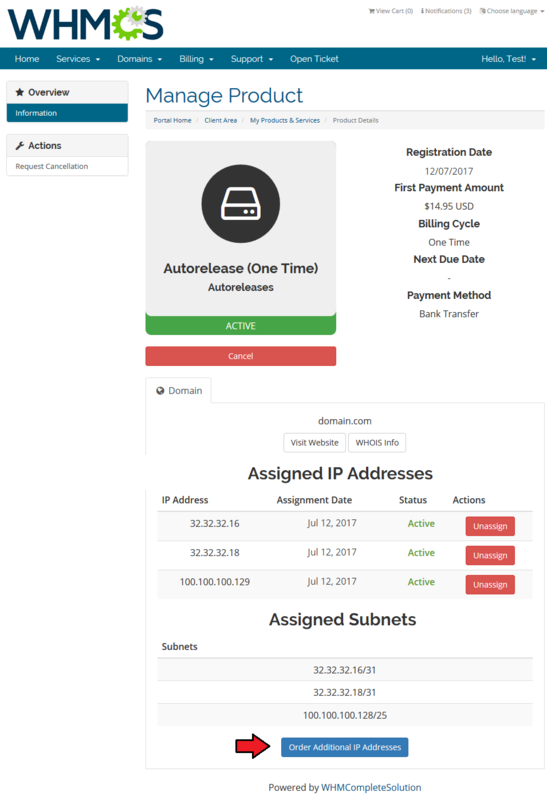 You may always unassign this IP from this service and again assign it to another one, delete the IP address, create custom field for this single address. 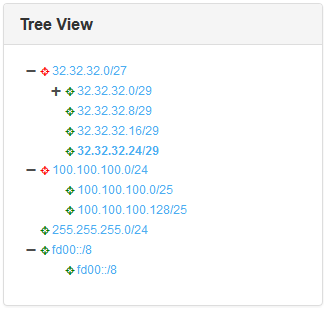 To clarify, a comfortable tree view of your created subnets and child-subnets is available. Let's take a look at it to summarize the divisions. You can see here a list of all subnets and child subnets in your IP Manager. Subnets marked with red already have some child subnets created, press any to show the list of child subnets. Any subnet can have child subnets created (with IP reservation rules taken into consideration) and custom fields assigned. Child subnets, however, can again have their child subnets created, can be split, merged or deleted. You may also manually exclude some IP addresses from a child subnet, assign clients and services directly to it and finally manage single IP addresses in such subnet. Below, you can find description of each option. For any configuration you provide into this field, 'Dedicated IP' field will be omitted. If checked, additional IP addresses will be stored in a custom field or 'Assigned IPs' field. If checked, in case of a server provisioning failure, relation will be saved. Automatically process the IP address when downgrading the configurable option. Module ignores error message from an external server and continues the action. IP addresses without product or user will not be displayed in 'IP Logs' page. If you check this checkbox, you will allow to add IP reservation rules. If you check this checkbox, you will receive an email with notification about IP subnets running out of IP addresses. Enables you to define percentage value which, when exceeded by any subnet, results in a notification being sent. 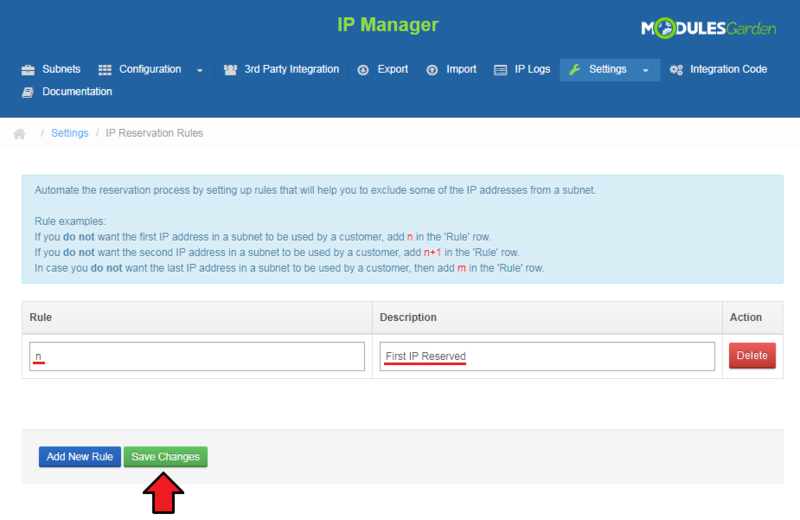 IP Addresses Cleaner allows you to restore/remove IP addresses form WHMCS/IP Manager/both depending on chosen settings. IP address are added to hosting if relation exists. IP address' relation are removed if IP address is not assigned to any hosting. If IP address does not exist in any subnet, it is removed from hosting. Create IP address' relation if it does not exist. If IP address does not exist in any subnet, it is removed from relations. Set IP address as unassigned if its relation does not exist. Important: After making any changes in those settings, press 'Update Settings'. Otherwise, settings will not be saved and the Cleaner will run using old ones. 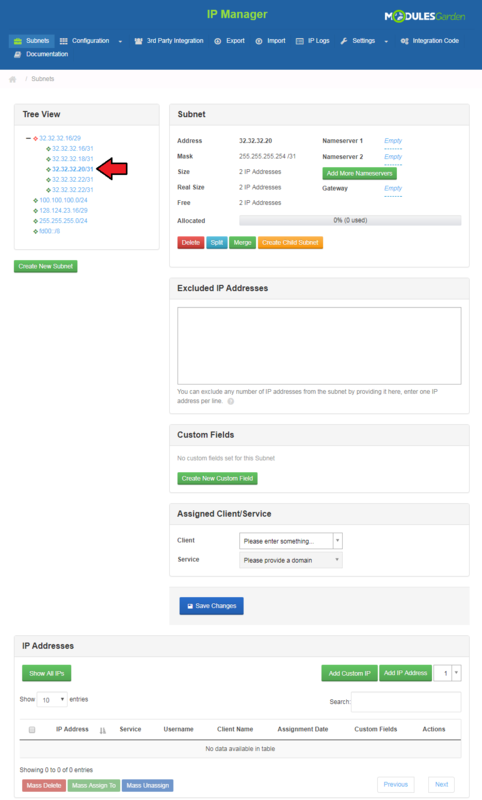 IP Addresses Cleaner allows you to automatically find and fix broken IP addresses assignment. For example, when you manually remove a product with IP addresses assigned or remove an IP subnet. To start IP Addresses Cleaner, press 'Perform Cron Cleanup' . Actions issued by the cleaner are listed in a popup as shown on the following screen. You can automate the process of IP assignment by adding some rules that will be then executed while assigning IP addresses from a subnet to clients or services. 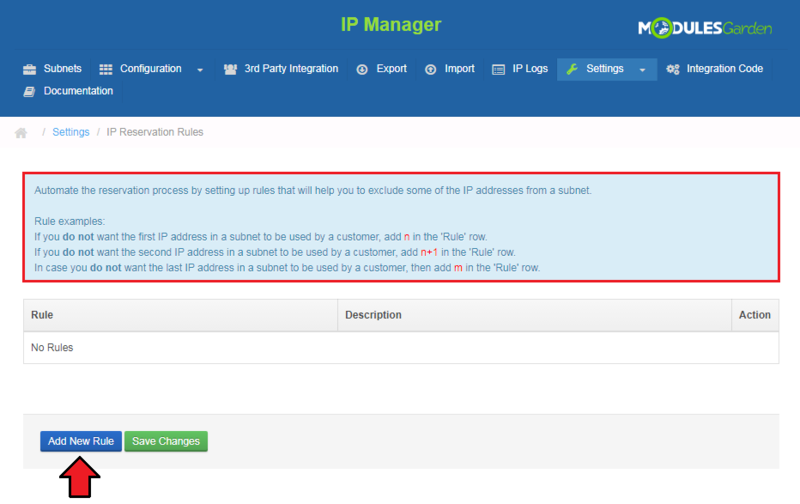 'IP Reservation' rules can be configured under 'Settings' section. 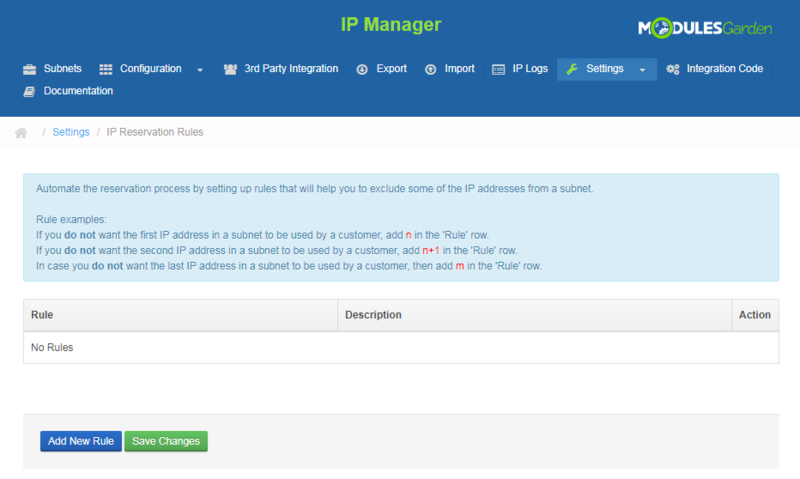 Use the rules consciously because they will be then taken into consideration while assigning any IP from any subnet in your IP Manager. Like it is stated in the guide visible on the screen you must stick to some standards while personalizing your assignment process. To add a new rule, type in the required value in the 'Rule' field and describe it in the text box nearby. Enter n in the 'Rule' textarea. Then the first IP address from a subnet will be always excluded. It will be reserved and it will not be assigned to any client or service. customized rules will substitute the need to fill out the 'Excluded IP Addresses' area. In this section ('Settings' → 'Default Custom Fields - Subnets') you are allowed to add and configure some custom fields that will be assigned to subnets by default. 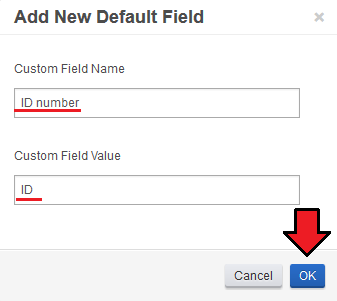 All you need to do is enter the name of your custom field, its value and save changes. Surely, you can create plenty of such custom fields and edit/remove the already existing. 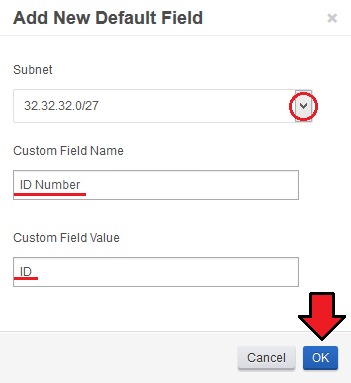 Section 'Default Custom Fields - IPs' allows adding default custom fields per IP address within selected subnet. Press 'Add New Default Field' to begin. Select subnet, the single IP addresses in which you wish to have the field assigned. You may point single subnet or select all existing subnets. Then, type in the custom field name and value. You can create plenty of such custom fields and then edit/remove the already existing ones. Keep in mind that if a custom field is assigned to all subnets, then action conducted on a custom field in a single subnet is triggered on all the other subnets! It is crucial to understand mechanism of automatic IP addresses assignment. In this section we will clarify it for you. 'IP Quantity' field defines the quantity of IP addresses added to the ordered product by triggering a specific relation. Two and more relations from one configuration can be triggered for the same product (therefore, multiple quantity of IP addresses can be assigned). Additionally, if you set up two configurations with the same relation, IP addresses from both configurations will be added. The main reason, why this module has been created, was to automate IP addresses assignment. Here we will show you how to set up its configuration. In order to start, go to 'Configuration' → 'Create Configuration'. Afterwards, press 'Create New Configuration' button. On the screen below you can see sample configuration with two products selected. Now you have to assign at least one subnet to configuration. Use 'Assigned Subnets' button. Choose a subnet from a dropdown menu and press 'Assign Subnet' button. Keep in mind that you can assign multiple subnets to a single configuration. See the list of subnets assigned to your configuration. On pressing subnet address you will be moved to its details where you can manage it. 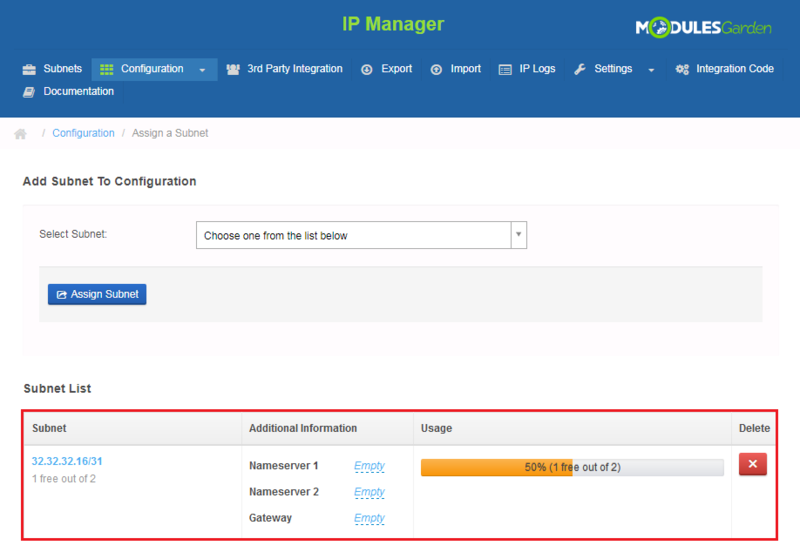 Let's say, that you want to set multiple IP assignment to specific product, it is available with our module! 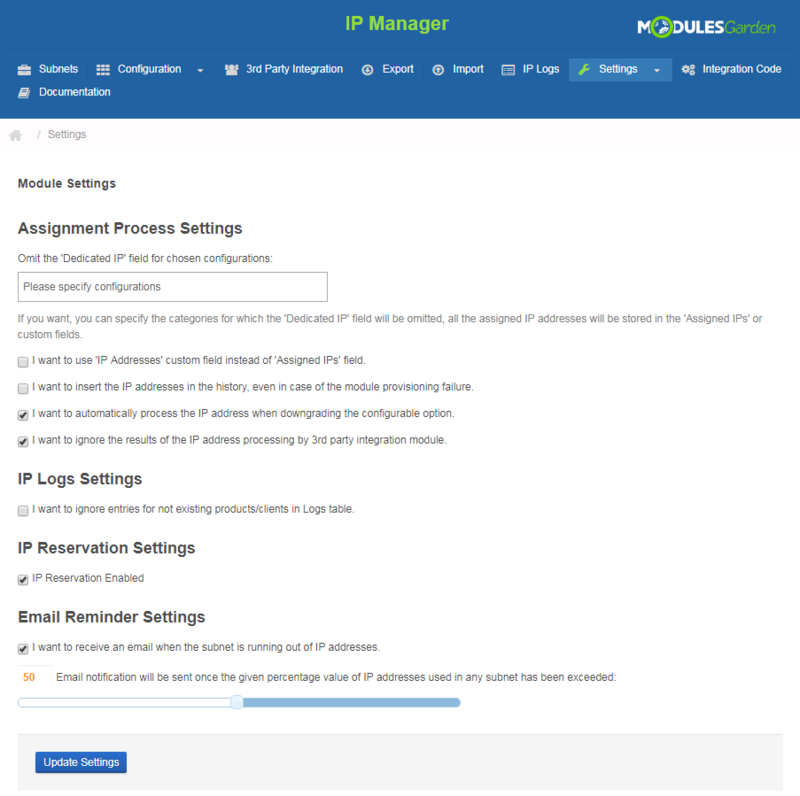 Here we will show you how to set up multiple IP addresses assignment to configurable option 'Extra IP Addresses'. Create a new configuration as while setting up a standard configuration. Once it is done press 'Configurable Options' as shown on the screen below. Afterwards, mark checkboxes next to configurable options you want to assign IP addresses to. Enter quantity of IP addresses which will be assigned to each configurable option and press 'Save Changes'. 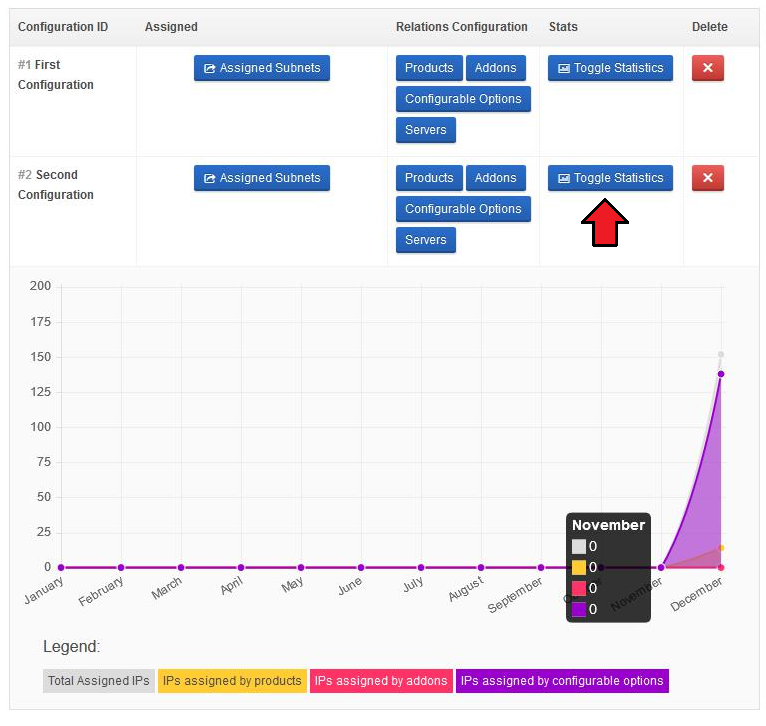 In each configuration you can find a graph, which shows the statistics of IP addresses assignment. 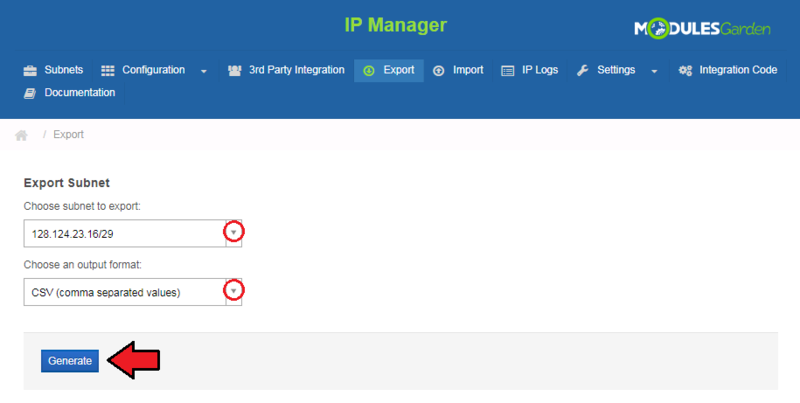 In this tab you can set up 3rd party integration which allows you to manage IP through our module in your WHMCS and synchronize changes on 3rd party servers. Note 1: Some of these integration submodules require free IP subnets (cPanel) or IP addresses (Plesk) on servers to be set up. 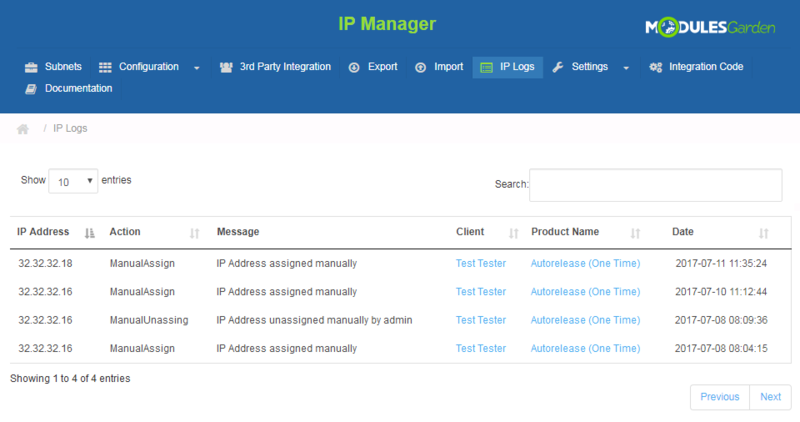 Note 2: IP Manager can integrate multiple IP addresses with a single product. 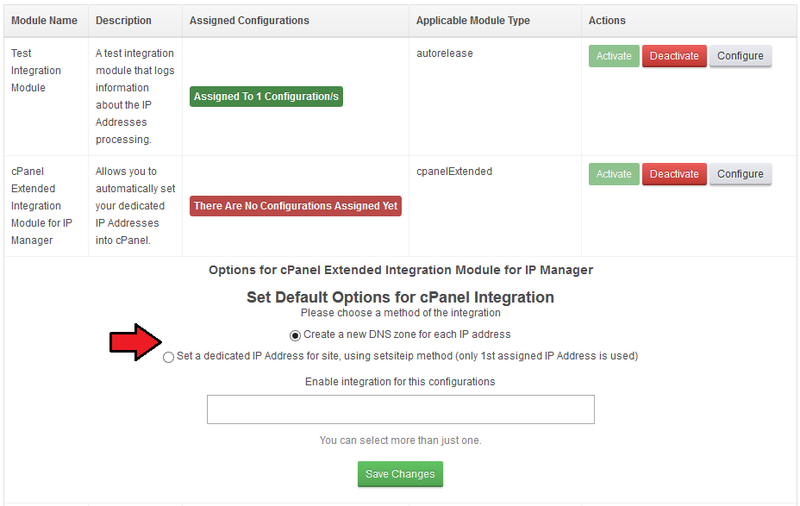 Activation of all integration modules looks similar, there is only a difference in cPanel and cPanel Extended integration submodules. Start by pressing 'Activate' button next to the module you want to activate. Press 'Configure' button and assign configurations to it. Confirm through clicking 'Save Changes'. cPanel and cPanel Extended additionally allow you to choose the method of the integration. Creates a DNS zone for each IP address assigned to a product. The first IP address assigned to a product is set up as a site dedicated IP address. As you can see on the following screen, you can easily check the quantity of configurations assigned to each 3rd party integration. Integration with Proxmox VPS For WHMCS and Proxmox Cloud For WHMCS is the only one to be set up both on the side of IP Manager For WHMCS and the integrated module. Note: This integration works for LXC and KVM virtualization types. 1. Create the subnet of IP addresses which will be used for a product. 2. Create the configuration and assign a previously created subnet to it. No additional action is required after this step. 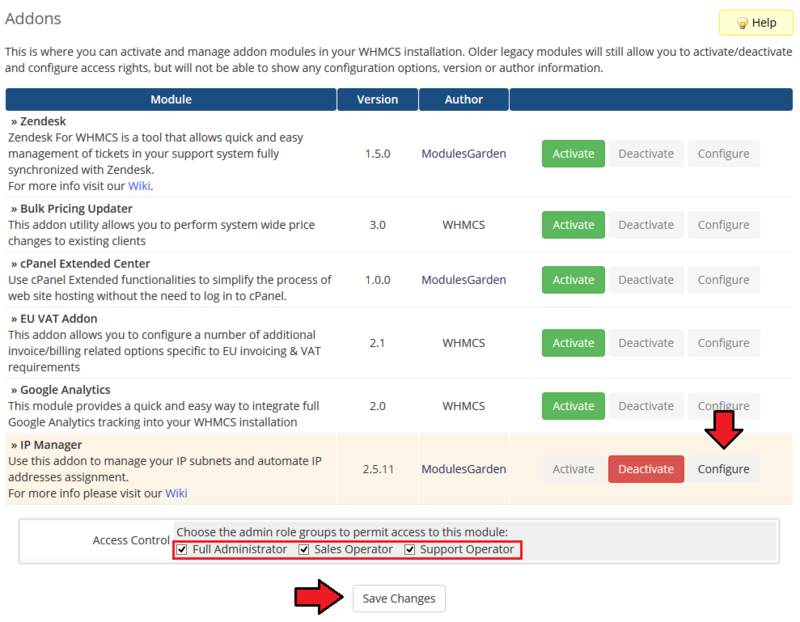 Important: Assigning anything other than the subnet to the configuration in IP Manager For WHMCS may bring unexpected results in your WHMCS environment. 3. When Proxmox starts creating a virtual machine, it retrieves the assigned IP address to the service and assigns it directly to the VM. i.e. the first VM to retrieve the IP addresses is the one whose creation process ends first. Integration with SolusVM Extended VPS For WHMCS is tricky. 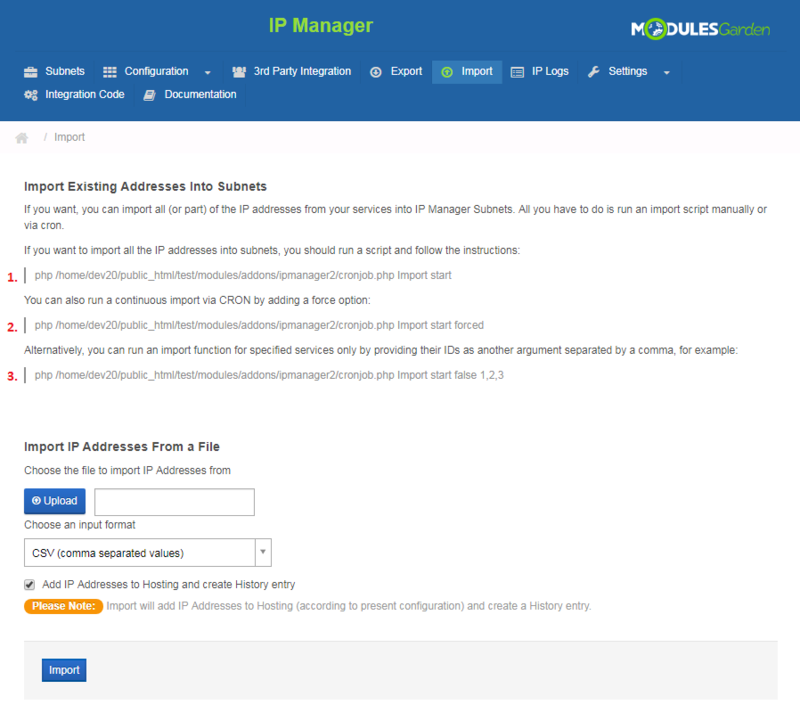 IP Manager For WHMCS cannot inject the first IP address to VPS, due to the way SolusVM API works. 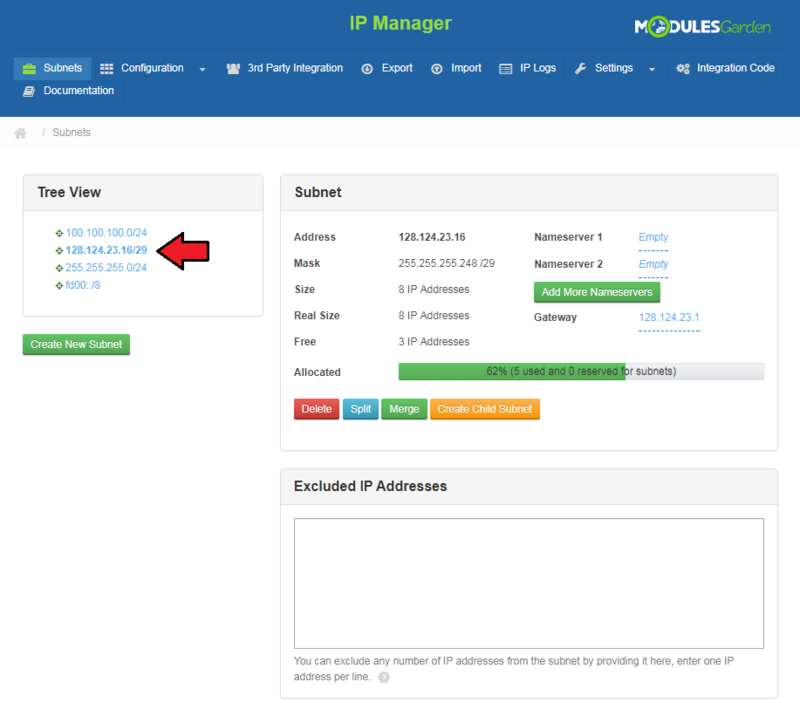 After creation of VPS, IP Manager is able to add additional IP addresses. Therefore, if you are using this integration, we advise setting up IP Manager synchronization as a cron job. This module logs information about IP processing for 'Autorelease' type products. Your order should look similar to the one on the screen below. Note: You need to set up 'Autorelease' type server, otherwise logs will not show up. You can create your own integration, all you need is knowledge of PHP programming language. You can do it through using 'Autorelease' submodule file. 1. 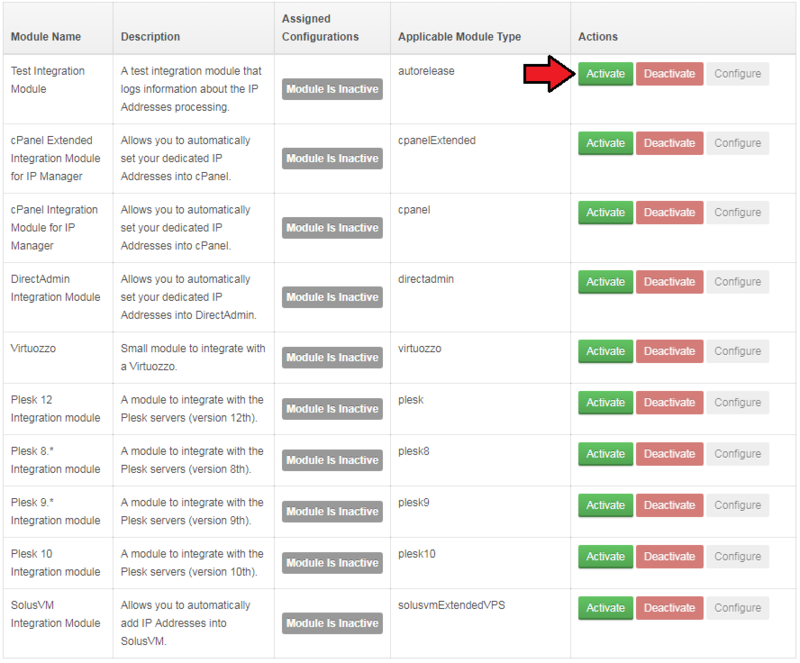 To start, make a copy of 'AutoreleaseIntegration.php' located in 'your_whmcs/modules/addons/ipmanager2/app/modules'. 2. Rename copy to your new submodule name. 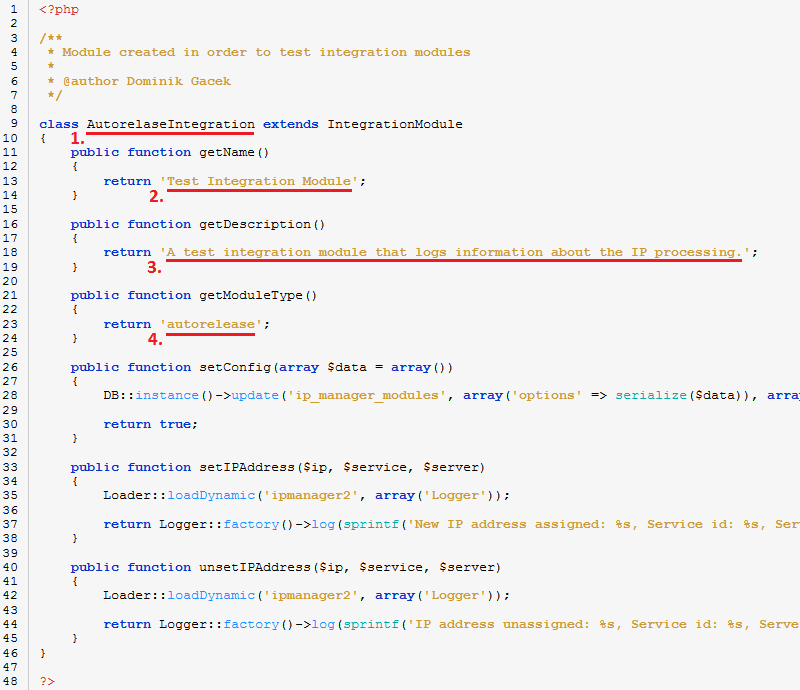 Note: File name has to end with 'Integration', for example 'NewSubmoduleIntegration.php'. 3. Edit the file, start by entering basic settings. 1. 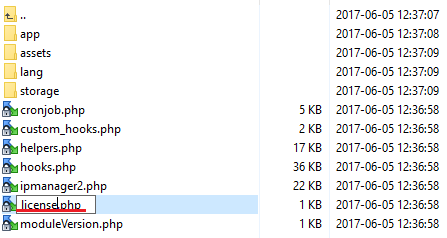 Class name should be the same as the file name. 2. Submodule name visible in IP Manager. 3. Submodule description displayed in IP Manager. 4. Place here an integrating module name ( the best way is to copy a folder name of the module ). 4. 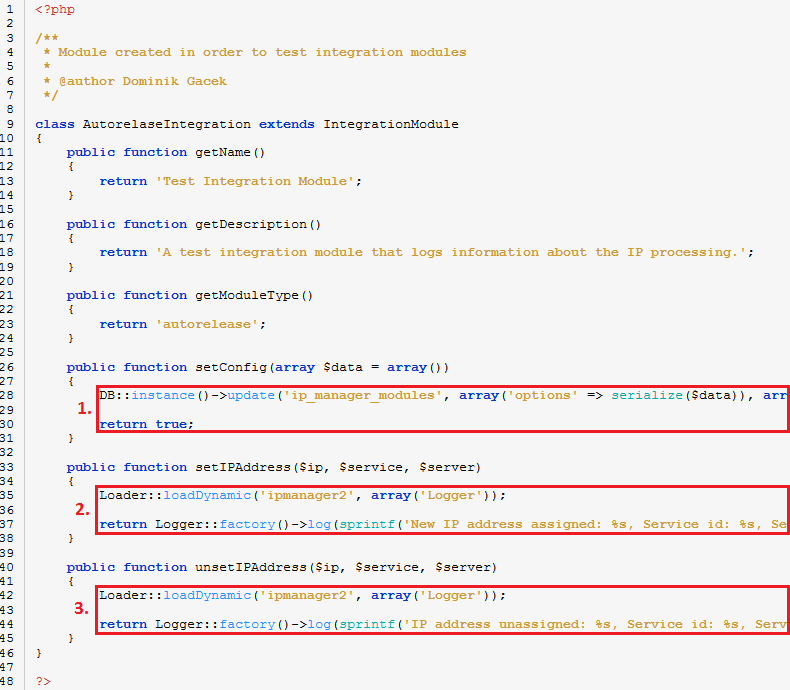 Now, it is time to implement integration part, you will need integrated module documentation to do it. 1. Configuration of 3rd party integration submodule. 2. Code assigning IP address to module product goes here. 3. You can add a code to unassign IP address here. 4. 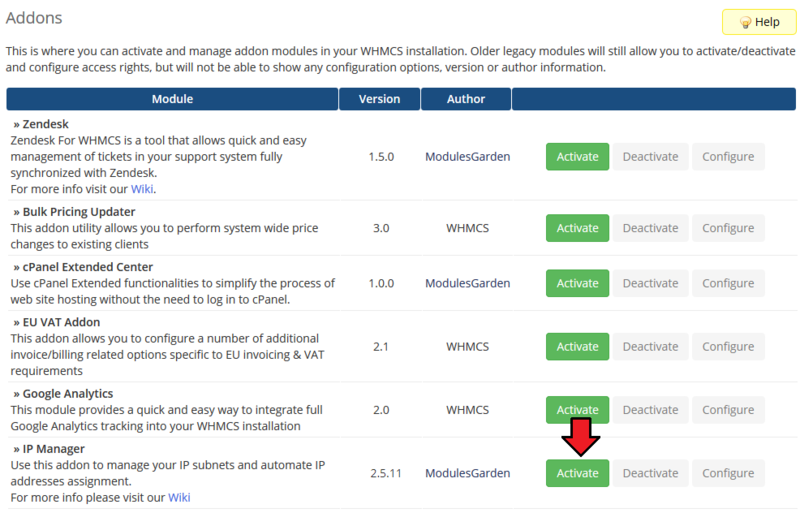 In order to view a submodule you have just created, log in to your WHMCS and go to 'Addons' → 'IP Manager' → '3rd Party Integration'. You can export your subnets with IP addresses to CSV and XML files. To export, go to 'Export' tab, choose subnet to export and output format. Now you can 'Generate' the file. Download of the file will start shortly. 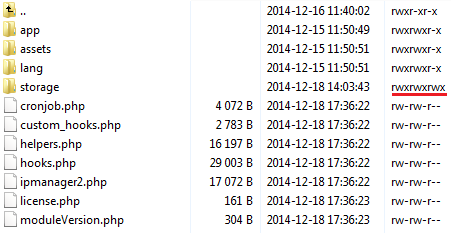 Note: Your 'storage' folder located in 'your_whmcs/modules/addons/ipmanager2' should have chmod set to 755. In 'Import' tab you can find tools to synchronize IP addresses from your WHMCS as well as import them from a file. Synchronization will confirm relations in your system with relations in IP Manager subnets. IP address is used by a product, but inside of IP Manager subnet it is marked as unassigned - record inside of a subnet will be updated. 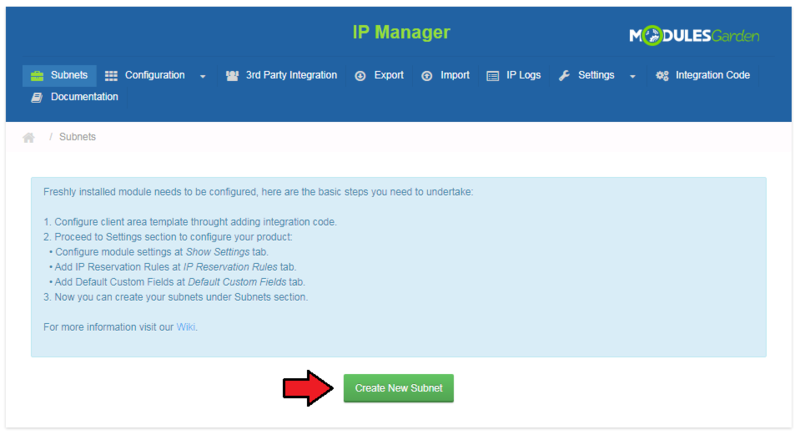 IP address is used by a product, but does not exist in any IP Manager subnet - a new subnet will be created. 1. This cron command synchronizes all products (it will require confirmation). 2. This cron command synchronizes all products (it will not require any confirmation). 3. This cron command synchronizes only products which IDs have been provided as arguments separated by comma. To import IP addresses from a file, select it, choose its format and press 'Import'. 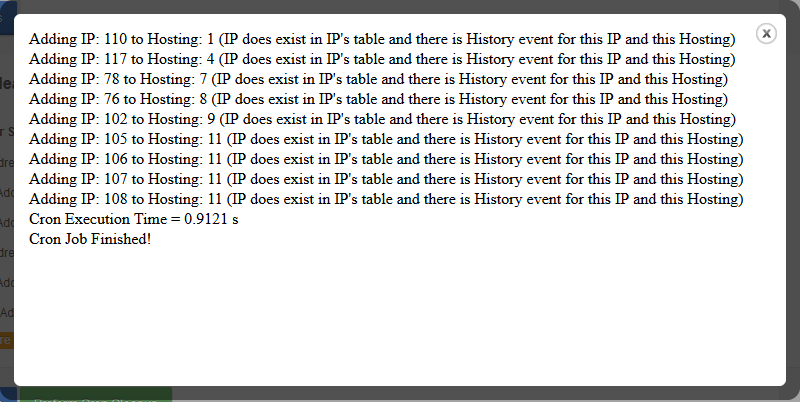 'Logs' page stores the history of actions ordered on each IP address. Integration described below is not obligatory. Module allows your customers to view IP addresses assigned to their product and order additional ones. In the client area it should look like on the screen below. 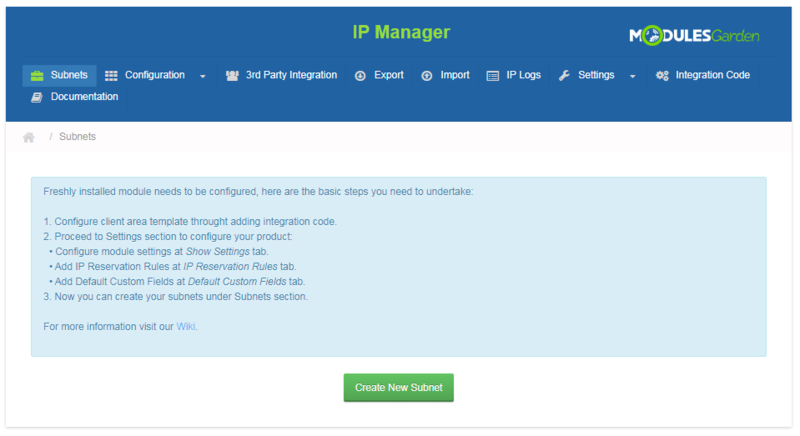 To allow your customers to buy a new IP address you need to set up a product addon for product and assign the addon to configuration in IP Manager. The above described integration works for all products without exception. However, in case you wish to restrict the integration to limited number of products, please insert the below codes instead of the one suggested in the addon. 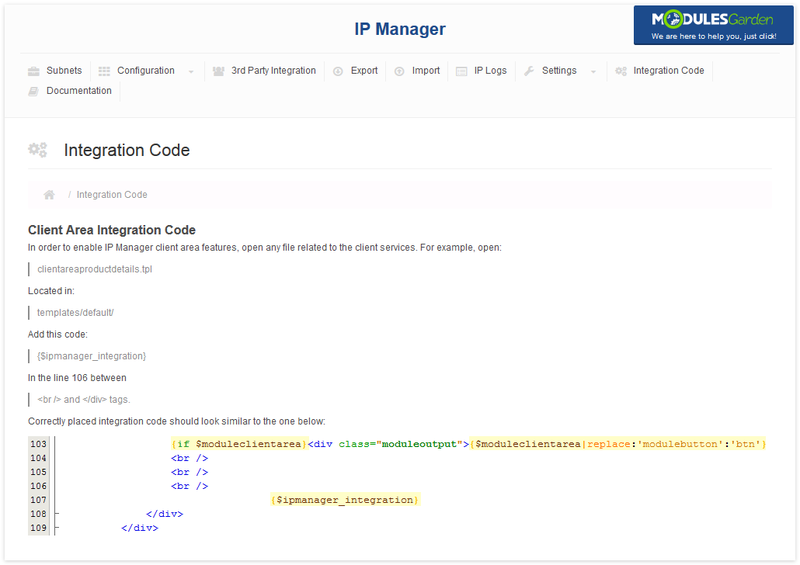 Once such code is inserted in the template, IP Manager will be displayed for product with ID that equals 26 or if the product is based on 'proxmoxCloud/proxmoxVPS' modules. 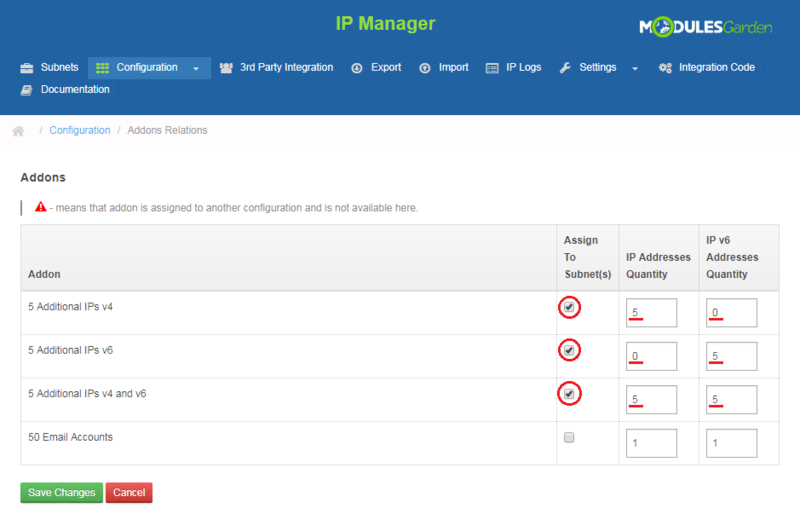 Extend the IP Manager integration according to your needs. The above code is just an example which can undergo modifications. In the 'Products/Services' tab located in your client's profile view in the admin area you can manually assign and unassign IP addresses from the chosen products. To start, select one of the products ordered by your client and press 'Manage IP Addresses' next to the 'Dedicated IP' field. A new window will pop up, allowing you to manage the assignment of IP addresses. Select one of your IP pools from the 'Tree View' . In the window to the right you can select IP addresses from the chosen pool and assign them to your client's product. Please note that only free and not assigned yet IP addresses will be available for selection from the dropdown menu. If any other IP addresses are already assigned to that product, you can replace them by toggling 'Override Already Assigned IP Addresses' . Otherwise, the newly selected IP addresses will be added to those already assigned. Additionally, toggle 'Use submodule' option if you want the 3rd party integration to be used. Please note however, that this option requires the current list of assigned IP addresses to be overwritten. This is to ensure that the synchronization works properly. 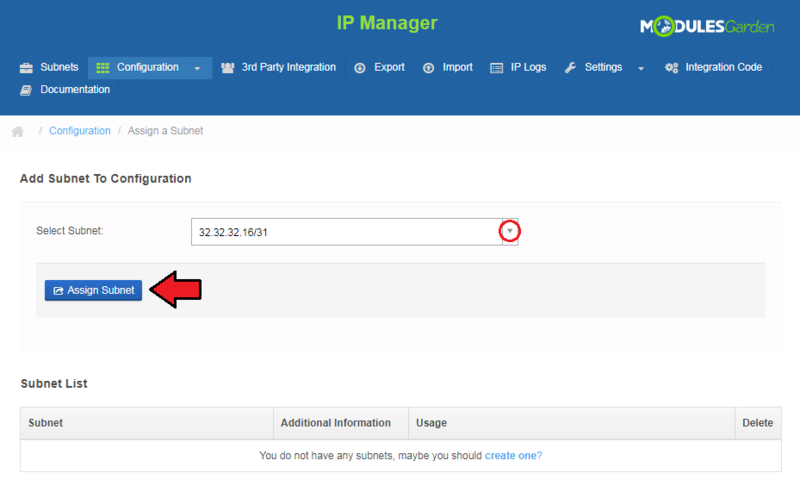 If you decide to leave this option disabled, the new added IP addresses will be assigned only in WHMCS itself. 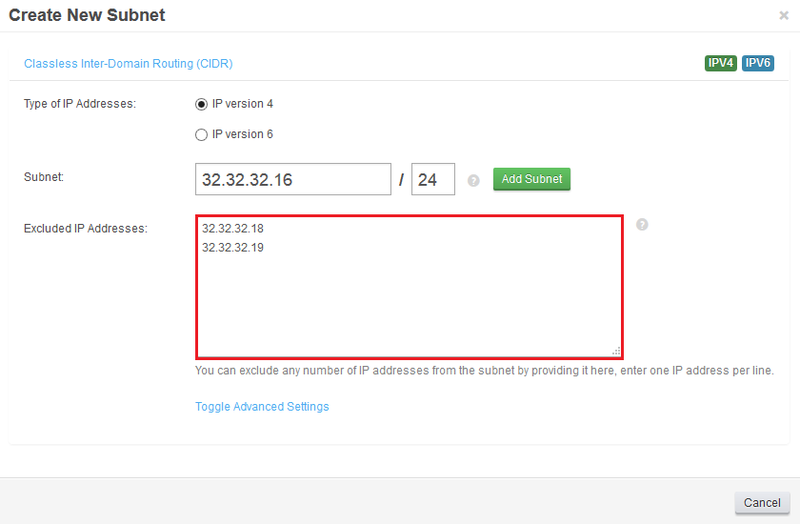 The third window in the bottom right corner allows you to manage the list of 'Already Assigned IP Addresses' . You can also preview there if any of the assigned IP addresses is also assigned using the 3rd party submodule integration. Additioanlly, you can 'Delete' any IP address from WHMCS, but it will not unassign this address automatically from the submodule. After its removal it will also return to the IP subnet pool. If you want to unassign an IP address from both WHMCS and 3rd party integration submodule, press the 'Delete And Unassign In Submodule' button which appers only for IP addresses already assigned in the submodules. 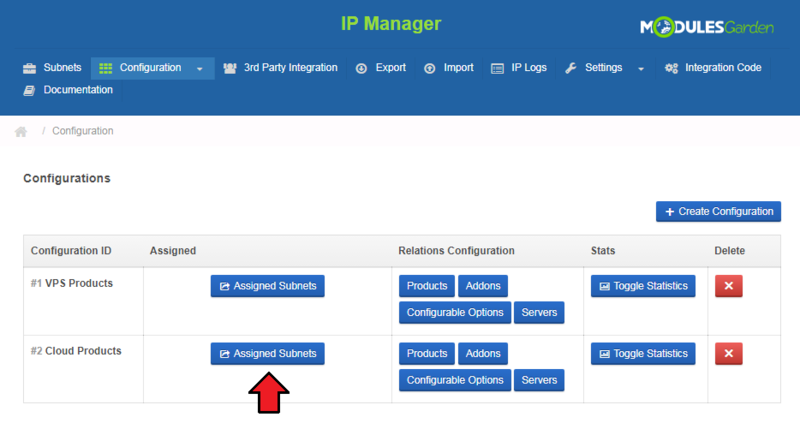 Note: If you need a bit more advanced management of a single assignment of IP addresses, go to the 'Subnets' section of the IP Manager addon. 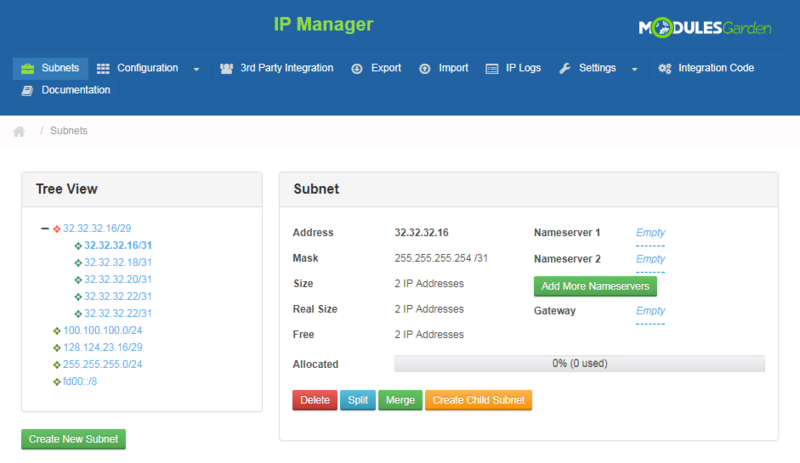 Your clients can view and manage their IP addresses and subnets thanks to installed IP Manager For WHMCS module. To remove any IP address or subnet from a product, simply press 'Unassign' button. Your client can also order a new IP address. Press 'Order Additional IP Addresses' as shown below. 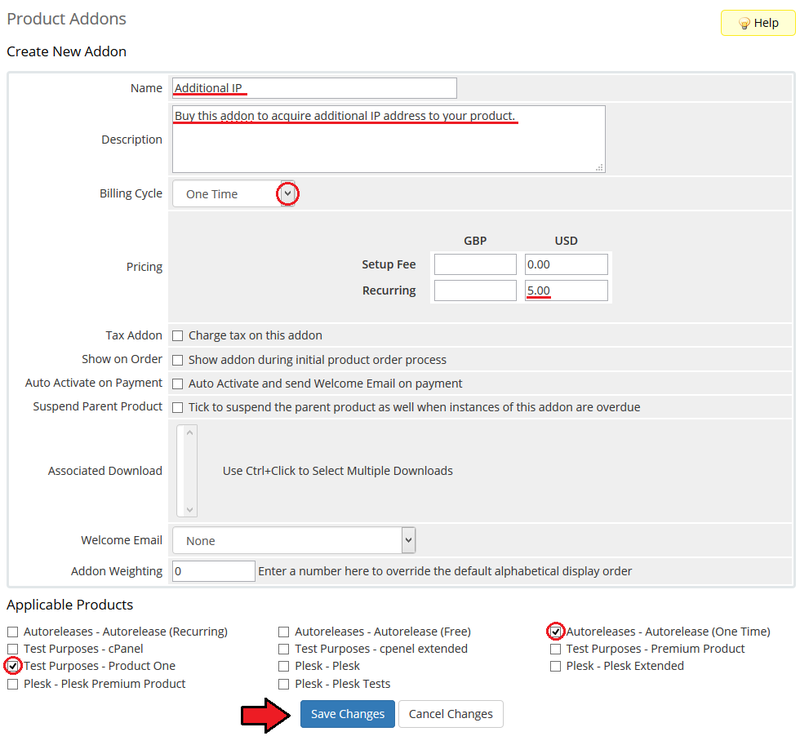 Your client will be moved to order form containing previously configured addons. As soon as the addon is active, new IP address is granted. 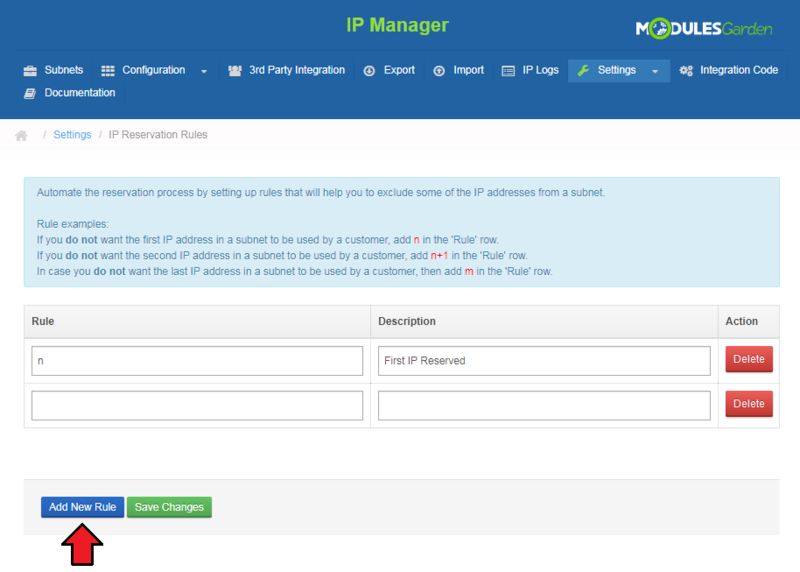 Setting up an addon allows your client to add an IP address to their product using integration. Go to 'Setup' → 'Products/Services' → 'Product Addons' and press 'Add New Addon' . Afterwards, enter addon name, addon description and select applicable products. Set pricing for addon by choosing 'Billing Cycle' and typing price. Confirm through pressing 'Save Changes' button. 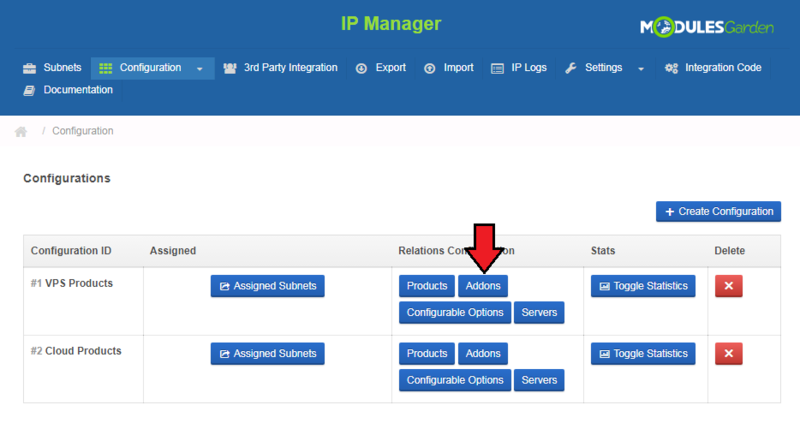 Now, go to 'Addons' → 'IP Manager' and use configuration created before or create a new one. Remember to add a previously created addon as a configuration relation. You can do it by pressing 'Addon' button as shown on the following screen. Tick checkbox next to addon and enter the quantity of IP addresses to be added. Afterwards, click 'Save Changes' button. If you enabled integration for the client area, your client should be able to order new IP addresses. Our module allows you to use custom hooks. All you have to do is create some functions using PHP programming language. To find details about hooks read 'custom_hooks.php' file. You can find there all hooks, information about their time of run, returned values and parameters. 1. If your client orders a product that is combined with two configurations (e.g. 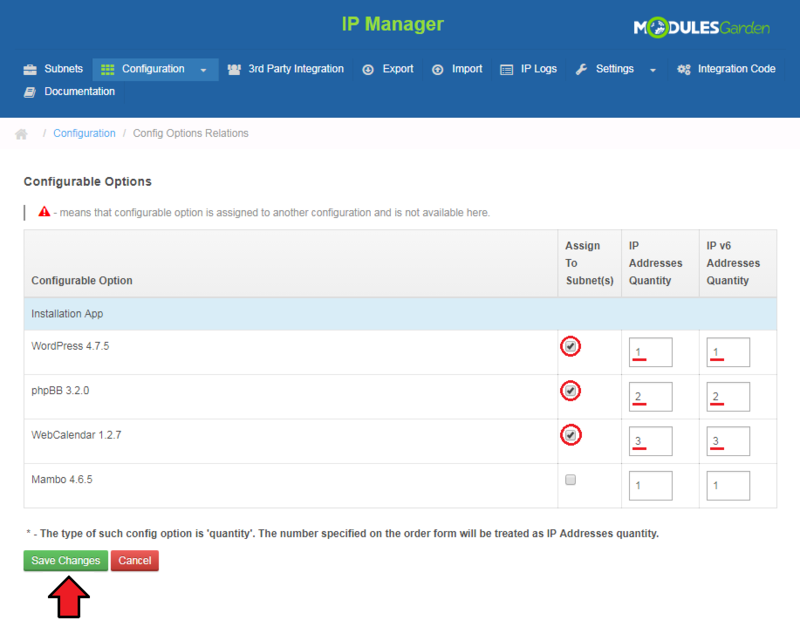 by product type and configurable option), IP Manager will add IP addresses from both configurations. 2. If you have used IPv6 block before the update to IP Manager 2.2.0, all of them will be migrated to corresponding subnets. Note that migration is done automatically for you. 3. 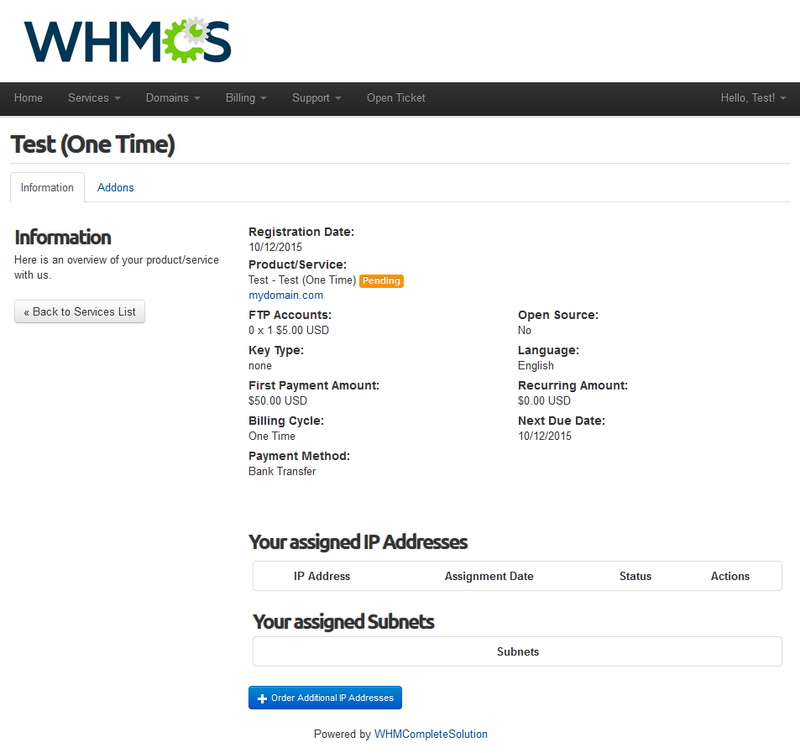 IP Manager For WHMCS requires GMP or BCMath installed on your server. 2. If you see something like this when moving to 'Addon' → 'IP Manager', remove content of 'template_c' folder. 3. If you export file and it is empty, check your 'Storage' folder chmod, it should be set to 755. Folder is located in 'your_whmcs/modules/addons/ipmanager2' . If you still have that problem, set chmod 777. This page was last modified on 29 March 2019, at 11:30. This page has been accessed 176,770 times.